Voter turnout in primaries and special elections has dramatically increased this year compared to past midterm elections. Turnout for Democrats has climbed 78 percent, while Republicans have seen a 23 percent uptick. As both parties begin their final post-Labor Day sprint to Election Day, there are concrete signs that Democratic voters are fired up heading into the midterm elections. Nowhere is that more evident than in the majority of states that have already held primaries. There's been massive increases in Democratic turnout while often a minimal uptick — or even noticeable dip — in turnout among Republican voters. 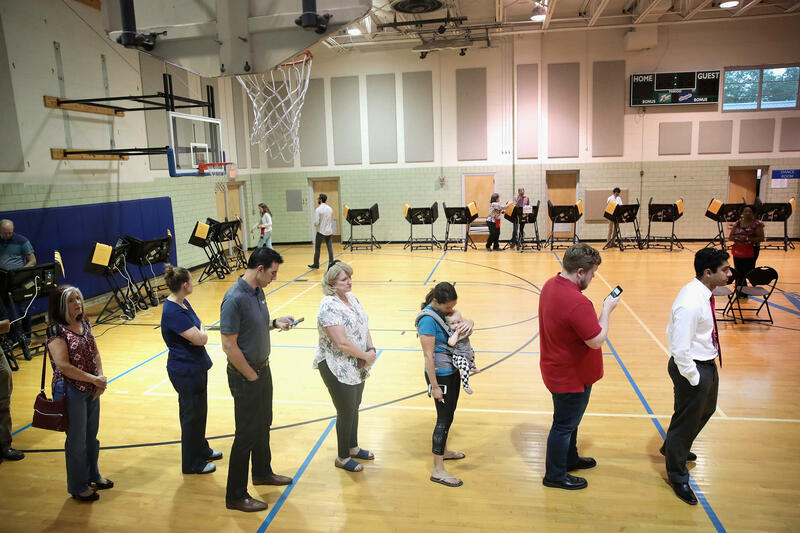 "What I'm seeing, with the exception of a handful of states, in state after state are huge increases in Democratic turnout relative to the increase in Republican turnout, when you look at 2014 versus 2018 turnout," said Republican pollster John Couvillon. "From looking at primary turnout as evidence of partisan enthusiasm, I'm seeing it on the Democratic side." Couvillon has been studying primary turnout for several election cycles. His research this year found that there are many indicators that predict this could be an election for Democrats on par with 2006 — the last time they won the House. According to Couvillon's data, Democrats saw a 78 percent increase in turnout compared to the 2014 midterm election. Republicans, meanwhile, saw an uptick of 23 percent. That's based on available data from 35 states that Couvillon studied. And among those states, 29 had better Democratic gains in turnout than four years ago, with only six states having higher Republican turnout between the parties since the last midterm elections. Democratic turnout accounted for 53 percent of primary ballots cast this year in those 35 states. In 2006 – the last time Democrats took control of the House – they made up 54 percent of the primary ballots. Compare that with 2010 and 2014, both strong years for Republicans, when 56 percent of primary ballots were cast for GOP candidates heading into those elections. Add historical precedent on top of that — since World War II, a president's party has lost an average of 29 seats in his first midterm — and President Trump's low approval ratings, and there are plenty of signs pointing to a good year for Democrats. In addition, Democrats go into the fall with a fundraising advantage. NBC News found that Democratic House candidates have raised $620 million compared to just $470 million for their Republican counterparts. On the Senate, there's also a noticeable, albeit slimmer, gap — $368 million for Democrats to $258 million for GOP candidates. "The scales are tilted against you if you're the party in power," Couvillon said. "Republicans are already having to deal with that, plus when you add to it to the considerable Democratic enthusiasm and that they're nominating some middle of the road-ish candidates, and it certainly makes for a tougher election cycle than Republicans have seen since 2008 or 2006." Democrats need to flip 23 House seats in order to win control, and the surge in enthusiasm indicates they could be poised for big gains in crucial states. Minnesota saw one of the biggest surges in Democratic ballots cast in the primary this year — a 206 percent increase from 2014. The state has four competitive House races this year, including two Twin Cities-area seats that Democrats hope to flip and two open Democratic-held seats on turf in districts President Trump carried by double digits two years ago. While the uptick in turnout is good news for Democrats, Republicans can hope that the 74 percent increase on their side will keep things competitive. In two important Midwestern states with multiple House seats up for grabs, Democratic turnout spiked while Republican turnout actually dropped from 2014 levels. In Illinois — where there are four seats that the Cook Political Report rates as competitive — there was a 170 percent increase in Democratic ballots, while Republicans saw a 12 percent dip. And in Iowa, where as many as three of its four congressional races are competitive, Democrats had a 154 percent increase in turnout, while Republicans saw a 36 percent decrease. Other states with multiple important House races also saw major Democratic turnout increases — Texas (up 88 percent for Democrats, compared to 16 percent bump for the GOP), California (82 percent increase for Democrats, with a 46 percent uptick for Republicans), New Jersey (89 percent increase for Democrats, with a 43 percent increase among GOP ballots), Kansas (133 percent increase for Democrats, while Republicans saw a 20 percent uptick), Michigan (120 percent surge for Democrats, compared to a 60 percent increase among GOP ballots) and Washington (76 percent increase among Democratic ballots, with only a 12 percent uptick among Republicans). For Republicans in those states' largely suburban districts that are considered the most vulnerable, these numbers are not a good harbinger of things to come in November. "If you're running behind 2016 levels, that's instant death if you're a Pete Sessions or Erik Paulsen," Couvillon said, citing endangered GOP incumbents in Texas and Minnesota, who represent two of the 25 districts currently held by Republicans that Democrat Hillary Clinton carried in 2016. It's those districts that Democrats feel the best about capturing, based on both the surge in turnout they've seen among their base and overperformance in a spate of special elections since the 2016 election. As we found in an NPR analysis last month, even though Republicans held onto eight of the nine special elections, Democrats saw a 10 point average shift in those races toward their candidates. Were that same margin to be applied to all 435 congressional districts (using the 2016 presidential margins as a partisan baseline) Democrats would net 63 seats in November — a massive wave which would easily give them control of the House. By and large, those special election districts were all far more Republican than ones the GOP will be struggling to defend this fall. And unlike during a special election, the party won't be able to spend millions defending individual seats if as many as 100 districts are considered competitive. The true battle for the House lies in the affluent, well-educated, often very diverse suburbs of major cities like Houston, Dallas, Kansas City, Denver, Miami, Minneapolis and St. Paul, Northern Virginia, Orange County California and more. Democrats say the polling they're getting in many of those districts shows competitive in several open seat contests and ahead of, or nearly even with, entrenched incumbents once thought untouchable. They believe independents and even some once-reliable Republican voters in these affluent suburban districts who were no fans of Trump in 2016 have soured on him even more since he was elected. Now, they're looking for a way to put checks on the White House. "Democratic voters are very enthusiastic about having the opportunity to weigh in on what's happening in our country, and it says that independent and swing voters are open to voting for a Democrat in some places where they haven't been before," said Ali Lapp, president of House Majority PAC, the House Democrats' major super PAC. But while the primary turnout may paint a bleak picture for House Republicans, it underscores that it's the Senate that could be the GOP's firewall this year. Already blessed with an incredibly favorable map even if Republicans run into headwinds — Democrats are defending 10 incumbents in states Trump carried — some of the GOP's target seats did see better Republican turnout. In West Virginia, where Democratic Sen. Joe Manchin faces a tough race against GOP Attorney General Patrick Morrisey, Republicans saw a 61 percent increase in primary turnout from four years ago, compared to just a 20 percent uptick for Democrats — a strategic realignment in a state that's historically had more registered Democrats but has long trended towards Republicans on the federal level. The same is true in North Dakota, where Democratic Sen. Heidi Heitkamp is being challenged by GOP Rep. Kevin Cramer. The state saw a 40 percent increase in GOP primary ballots over 2014, while Democrats saw a 23 percent increase. Turnout results also show that Florida is, once again, poised to be a battleground. Unofficial results from last Tuesday's primary showed Democrats with a slightly higher turnout than Republicans — about an 80 percent jump from four years ago — but Republican turnout increased by 70 percent. The nearly-equal levels of higher turnout show both parties are engaged and why the Senate, gubernatorial and several House contests there could be quit close. There are more encouraging signs for Democrats in two states where they hope to win seats, Nevada and Arizona. Democrats would need to flip at least two Republican-held seats and not lose any of their other races in order to win the Senate this fall. In Nevada, where GOP Sen. Dean Heller is one of the most endangered incumbents, Democratic turnout increased by 88 percent compared to just 21 percent for Republicans. While Arizona's primary results from last Tuesday aren't yet official or complete, Democrats saw growth there too as they try to gain the seat of retiring GOP Sen. Jeff Flake. Democrats will still have to work to convince these voters to come out in November — as they learned that hard lesson in 2016 of the danger of complacency — and in some states with open primaries, voters may often have pulled party ballots with the more interesting or competitive race. But the shift across the board in more enthusiastic primary turnout for Democrats is yet another alarm bell for Republicans ahead of Election Day on Nov. 6.